High voltage substations are points in the power system where power can be pooled from generating sources, distributed and transformed, and delivered to the load points. Substations are interconnected with each other, so that the power system becomes a meshed network. This increases reliability of the power supply system by providing alternate paths for flow of power to take care of any contingency (by selecting the most suitable circuit schemes), so that power delivery to the loads is maintained and the generators do not face any substation outage. The high voltage substation is a critical component in the power system, and the reliability of the power system depends upon the substation. 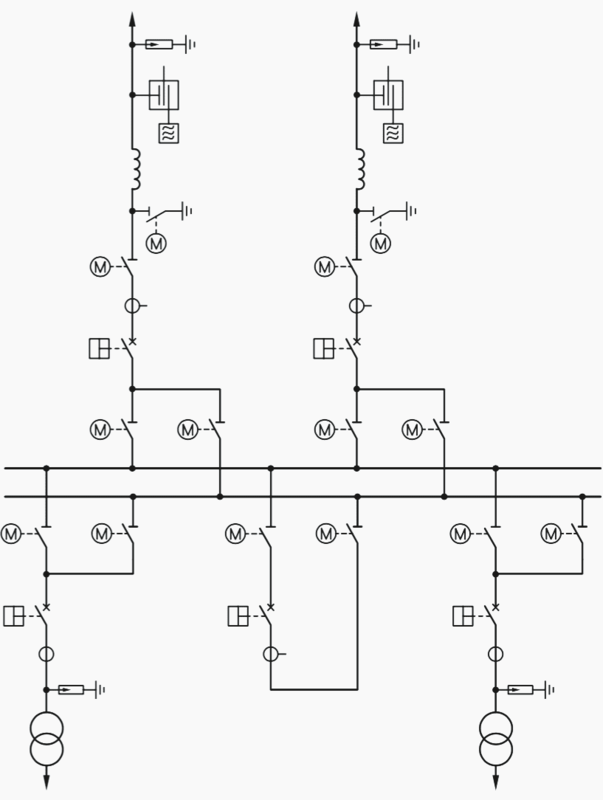 Therefore, the circuit configuration of the high voltage substation has to be selected carefully. Busbars are the part of the substation where all the power is concentrated from the incoming feeders, and distributed to the outgoing feeders. That means that the reliability of any high voltage substation depends on the reliability of the busbars present in the power system. An outage of any busbar can have dramatic effects on the power system. An outage of a busbar leads to the outage of the transmission lines connected to it. As a result, the power flow shifts to the surviving healthy lines that are now carrying more power than they are capable of. This leads to tripping of these lines, and the cascading effect goes on until there is a blackout or similar situation. The importance of busbar reliability should be kept in mind when taking a look at the different busbar systems that are prevalent. The applications of this simple scheme are distribution and transformer substations, and feeding industrial areas (see figure 1). 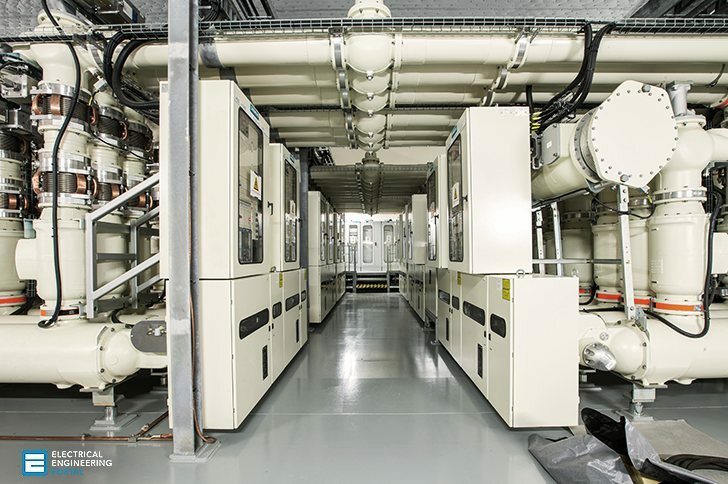 Because it has only one busbar and the minimum amount of equipment, this scheme is a low-cost solution that provides only limited availability. In the event of a busbar failure and during maintenance periods, there will be an outage of the complete substation. To increase the reliability, a second busbar has to be added. 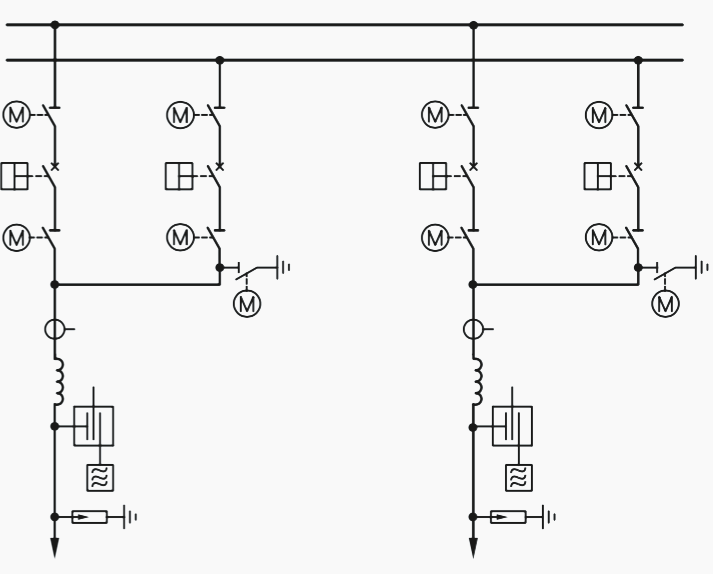 The more complex scheme of a double-busbar system gives much more flexibility and reliability during operation of the substation (see figure 2). For this reason, this scheme is used for power distribution and transformer substations at the nodes of the power supply system. It is possible to control the power flow by using the busbars independently, and by switching a feeder from one busbar to the other. Because the busbar disconnectors are not able to break the rated current of the feeder, there will be a short disruption in power flow. To have a load change without disruption, a second circuit- breaker per feeder has to be used. This is the most expensive way to solve this problem. In very important feeders, the 2 CB solution will be used (see figure 3). The one-breaker-and-a-half is a compromise between the 2 BB and the 2 CB scheme. This scheme improves the reliability and flexibility because, even in case of loss of a complete busbar, there is no disruption in the power supply of the feeders (see figure 4). 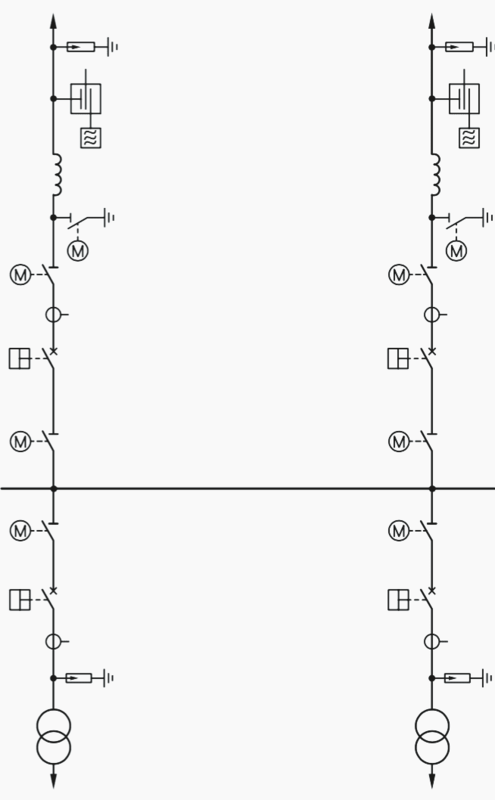 For important substations at the nodes of transmission systems for higher voltage levels, the 3-phase busbar scheme is used. It is a common scheme in Germany, utilized at the 380 kV level (see figure 5). Is the three bus scheme is similar to double main and transfer scheme or any difference is there. because I am seeing from the SLD that buscoupler is connected with both the buses and transfer bus coupler is not available. please clarify. Edvard – Thank you for your excellent work on this portal, I always take a look at what you put on here. However I think today you have not done the best job. 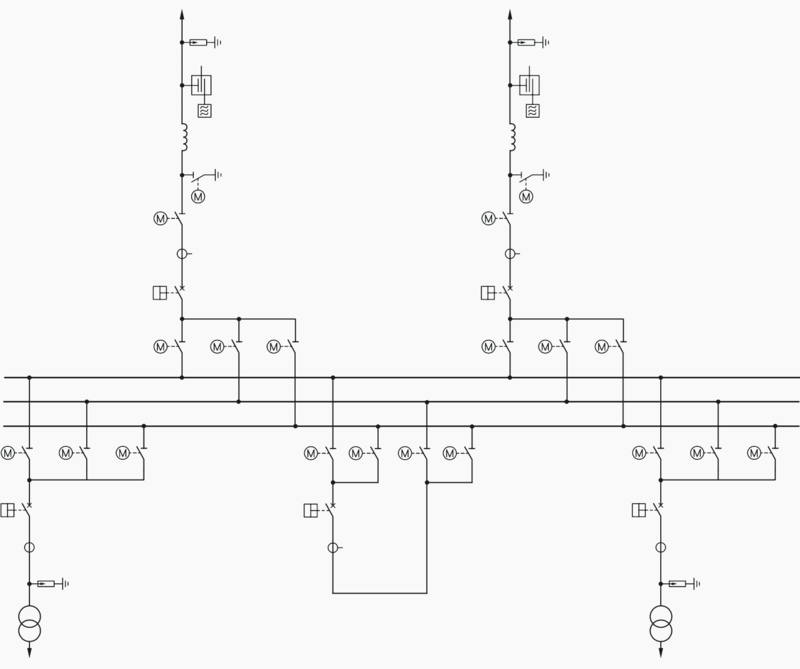 A Double Busbar system (132kV and above will have Bus Sections and Bus Couplers which effectively form four busbars, carefull selection of feeders and TX’s will usually prevent a power outage for a single busbar fault. The 3 phase system you describe, i am not familiar with, and I’m not sure it is any better, aren’t all the arrangements you describe 3 phase?? we usually use earthing switches without motorize mechanism in MV panels But as i see in your schemes in HV switchgears we do it …why?